Kai Ann just turned 1, and I had realized that I didn't do her birth story! That is why people say you gave 100% to the first child, and the 2nd. one you just went along! Anyway, I better do her birth story before I forget the details! Pregnant with KA was more complicated. I suffer from morning sickness for the first trimester, and during my 3rd trimester, I got Gestational Diabetes, and had to be on insulin. At 36th week, we followed had KA delivered by C-section. We went to the UMSC early in the morning for admission, and paper works, the mid-wife monitor me with the CTG and everything was normal. We waited for the OT to be ready while Bro and hubby nodding away beside me bed. This time less chaotic, firstly because we were more "experienced" and secondly, this was not an emergency c-sect like KJ had, so everything were going according to plan. Ronnie stayed with me at the waiting room at the OT while waiting for the Anesthetist to arrive because it was a Sunday, and I did not prebook her. Once in the OT, everything went smoothly, except my heart beat went up and felt the same suffocation when my right arm was not elevated slightly. It happened when I had KJ too. I requested to propped my arm up but they didn't allowed me at first, I did warn them, but not until I show sign of distressed and short of breath only they rolled up a cloth to elevate my right arm, and everything went back to normal again. Prof. Eugene was very good with his work, getting KA out and stitching me up. This time I get to hold my baby and kiss her before she is wheeled out to meet her papa. Tears rolled down my eyes without me realizing it, till I felt the warmth of them. Before me is the most beautiful baby girl in the world! 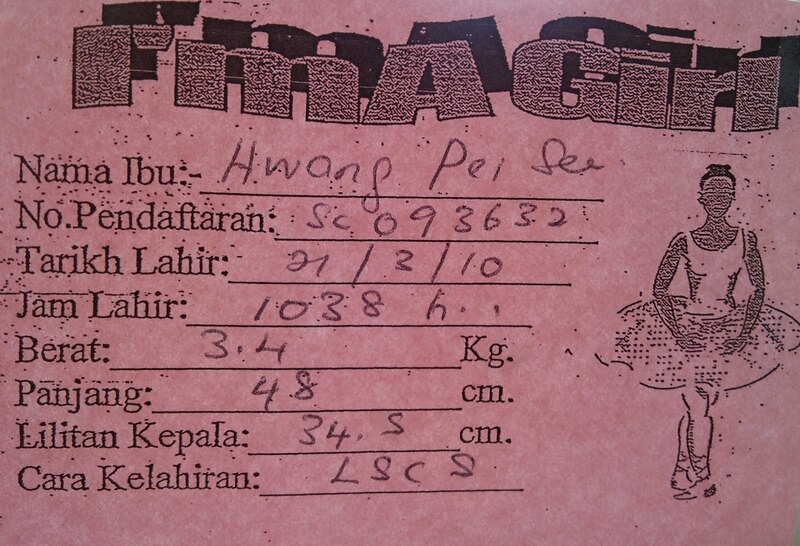 She was 3.4KG at birth, length was 48cm. Welcome to the world little princess! It had been a wonderful 1 year, and we love you so much!